The mission of the HCHS Library is to provide materials and instruction that help students achieve academic success and foster a love of reading and lifetime learning. The library contains 17,577 books, 800 nonprint items, a periodical collection, and a 500+ research topic information file. The librarian teaches research skills to class groups and individual students as needed. 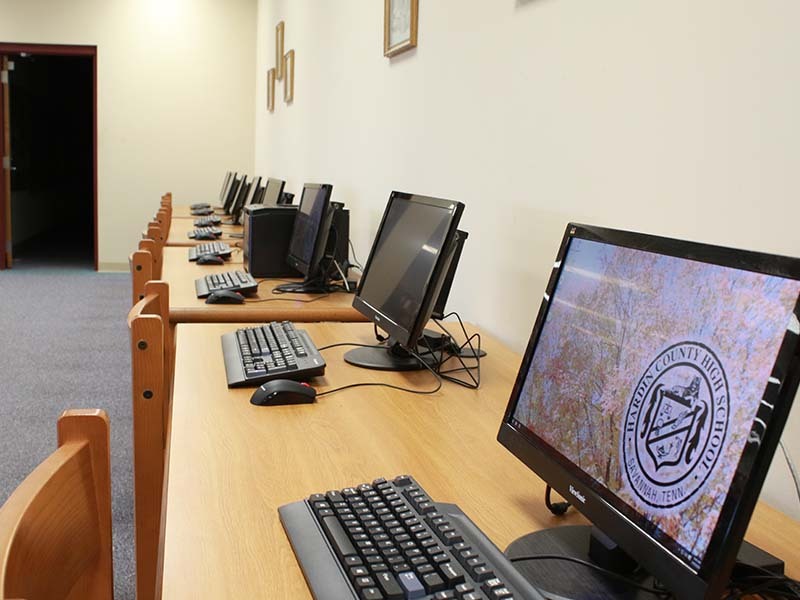 Fifteen sit-down computer stations and three stand-up OPAC stations are available for student use. All library computers provide access to Accelerated Reader, Microsoft Word, the HCHS Library OPAC, the Tennessee Electronic Library, the Internet, and print to a single printer. The circulation desk has two automated checkout computer stations. The library installed twenty new computers in February 2016. Students can print free of charge as needed. 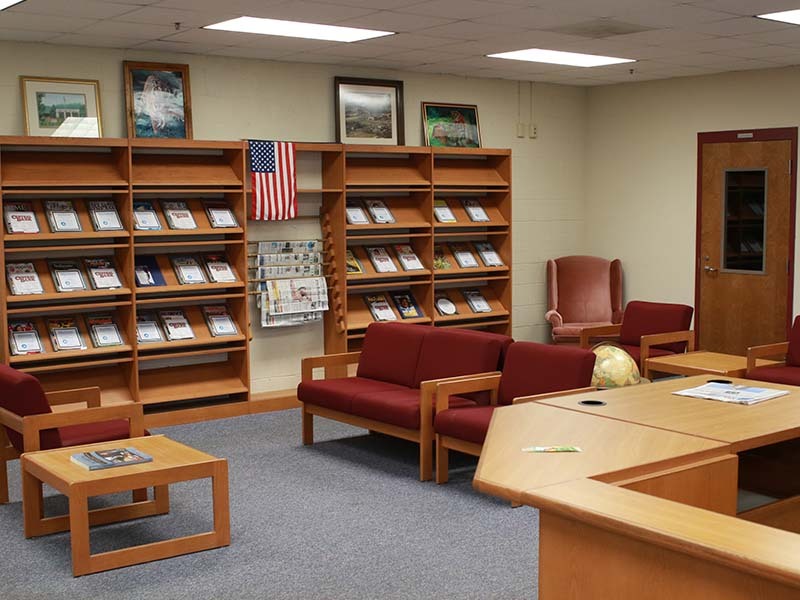 The HCHS Library is designed to maximize usage and minimize interruptions. The high-traffic and most public zone which includes current periodicals, a casual seating area, and the AV room is located near the entrance. These areas can be accessed without bothering students working in the class areas. In addition, designated entrance and exit doors ease traffic flow. A Checkpoint security system gate at the exit door protects library materials from theft. A medium-traffic zone includes the circulation desk, library computers, and the book collection areas. These areas are easily accessible from the entrance as well as the class areas. The circulation desk is arranged for efficient library business. Patrons waiting in line to check out materials do not block or deter others. A book return slot is immediately visible when entering the library, and an additional book return slot is located in the hallway. Both the regular book collection and the reference areas are also medium-traffic and equally accessible from the library entrance and from the class seating areas. The arrangement and height of book shelves insure that the entire library is easily visible. Glass windows in the library office and a security mirror in the far corner also help with library supervision. Reference books are nonfiction books are arranged by the Dewey Decimal System. The fiction collection is divided into several genres which include classic, mystery, fantasy, sports, science fiction, Christian, guys, and girls. The HCHS library catalog (OPAC) is used to find books. Two low-traffic seating areas for classes are located to minimize distractions for students working there. In addition, a low-traffic library work area is located behind the circulation desk and includes library offices, the workroom, and the magazine room. Students do not usually need access to these areas. HCHS uses Accelerated Reader, a computer-based reading management program, to encourage and track good reading practice. All students are required to achieve AR points in English courses. Several other classes also offer AR points as an extra credit option. The library has approximately 8500 fiction and nonfiction AR books on a wide variety of subjects and reading levels. AR Book Finder tells if a book title has an AR test available. HCHS Library AR books have the reading level and point value printed in the back of each book. This information is also available in the OPAC at https://hctnschools.booksys.net/opac/hchs. Students must have the book along to take an AR test in the library. Most AR quizzes have 10 multiple choice questions, although some have 20 questions. In 2015-16, 1020 students took 7186 AR tests and achieved 55.078 AR points. Reading skill improvement is a library goal. In 2012-13, HCHS students read 99% fiction/1% nonfiction with an average reading level in AR of 5.1. In 2015-16, students read 80% fiction/20% nonfiction with an average reading level of 5.5. Students are encouraged to read at levels that challenge them and also to read more nonfiction or informational text. The HCHS Library teaches and promotes the use of the Tennessee Electronic Library research. TEL is a huge virtual library that can be accessed online via a school computer, home computer, or smart phone. Since 1999, TEL has provided free access for all Tennesseans to over 400,000 magazines, journals, podcasts, videos, e-books, test prep materials and more!